The ruins of Hadrian's Wall form the most spectacular Roman remains in Britain. Built on the orders of the Emperor Hadrian c. A.D. 122 at the northernmost limits of the Roman province of Britannia, the wall, stretching from the North Sea to the Irish Sea (from the Tyne to the Solway), was 80 Roman miles (about 73 modern miles) long, 8-10 feet wide, and 15 feet high. 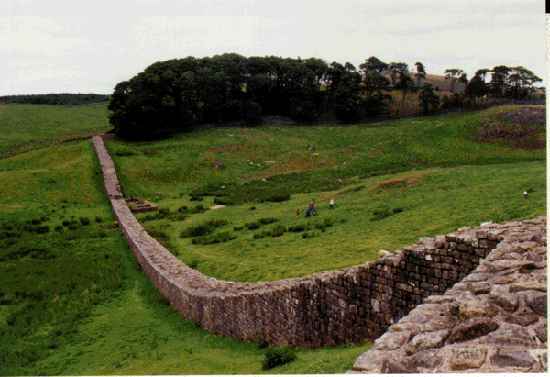 Today, the best remaining sections of the Wall in Northumberland are only 1 metre high but they are still very impressive.